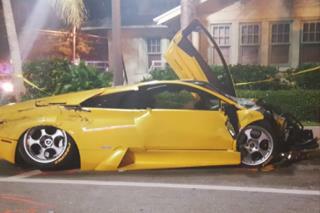 (Newser) – Florida police say a heath club chain mogul and his girlfriend had been drinking when they hopped into matching luxury yellow sports cars shortly before Roger Wittenberns' speeding Lamborghini plowed into an SUV, killing the 82-year-old driver last Wednesday. Wittenberns, 60, and longtime girlfriend, Patty Ann McQuiggin, 61, were allegedly speeding side by side in Delray Beach, reports the Palm Beach Post, when witnesses say Wittenberns' car struck a Buick Enclave driven by J. Gerald Smith, per WPTV. Smith, a retiree who was earning extra money driving for Uber, died soon after the crash. Wittenberns, the multimillionaire founder of the Lady of America fitness club chain, was thrown from the car but survived and was hospitalized in serious condition. McQuiggin allegedly ditched her Porsche, fled the scene, and refused to give a statement to police. Older Uber drivers are more interesting than young ones. The young ones don't have any conversation skills because they are digital era kids. The older ones can talk you into the curb. Now it does take an extreme as I often rent with Enterprise for one of the $9.99 fun weekends. I do a rental from Friday to Monday and get something sporty and drive it up to Tulsa. I do the rental because I drive the thing like, its a rental. Its not uncommon for me to turn one in with the "check engine" light on. I broke a car on one occasion and had to swap it out. My deal is that I use the "pick you up" option and I sometimes get this retired bank owner. He's highly opinionated and also likes to finish your sentences. I get into a salty discussion with him on things like home investing and Forex. He almost always takes the opposing view to a point he's really annoying. "McQuiggin fled the scene and ditched her Porsche at a nearby pizza restaurant, police said, per the Post. When police found her later at the home she shares with Wittenberns, she refused to give a statement"????? So why isn't this killer behind bars???? Who in the hell does she think she is??????? Hillery Clinton??????? Hunting Elizabeth, not here, that's 0 for 1!